Nearly every component of the game has multiple functions, and there is rarely a single solution to any obstacle. Will run on Windows and Android. The single-touch input controls designed for mobile control movement, firing, and shield recharge. While pressed, the ship can move and fire, though is exposed to attacks and does not attract energy drops. Energy drops also have a dual purpose. When they touch your ship you regain energy, and when they drop below screen they move to Earth in the background. Energy is spent every time the ship fires, and every time the shield receives damage. This has the additional effect of energy being spent in order to move. Earth in the background serves both as a progress indicator and powerup dispenser. 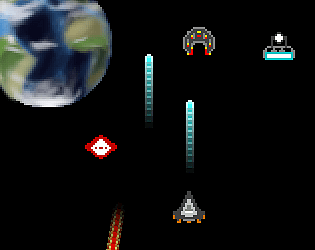 Destroying enemies and allowing energy units to pass below screen will bring the planet closer to the bottom of the screen. Allowing enemies to pass your ship, and having your ship get destroyed will send the planet further away. Too far and it's game over. There are 4 enemy types and 2 obstacles. Each enemy has distinct abilities and movements that provide their own advantages and disadvantages, forcing the players to plan and choose their targets, and can be destroyed by either the bullets or the shield. Random spawns will keep players on their toes. Having enough energy pass to Earth will spawn one of three upgrades: An energy tank to boost capacity, a firing upgrade to increase bullets fired per shot, and a cluster bomb mine to take out groups. The energy required changes depending on the location of Earth on the screen, which is persistent. The player being destroyed will remove all upgrades, but will also reset the enemy spawner, acting as a reprieve following a frantic firefight. The bombs that randomly spawn will destroy the player, but are easy to shoot and detonate at a range to take out out nearby enemies. Enemy explosions will also damage nearby foes, and bombs will not affect the position of Earth if they pass the player. The asteroids that spawn will destroy both the player and foes, but also act as shields from enemy bullets and can be destroyed with the bombs or cluster mine.